S I G N & D I G I T A L G R A P H I C S • October 2014 • 55 film is ready to be applied. The liner can be paper or plastic based. 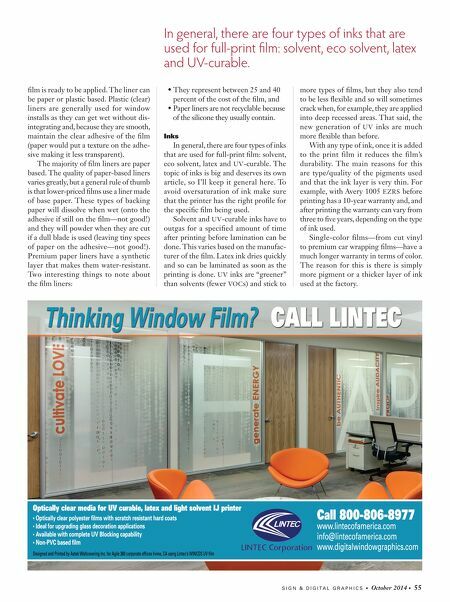 Plastic (clear) liners are generally used for window installs as they can get wet without dis- integrating and, because they are smooth, maintain the clear adhesive of the film (paper would put a texture on the adhe- sive making it less transparent). The majority of film liners are paper based. The quality of paper-based liners varies greatly, but a general rule of thumb is that lower-priced films use a liner made of base paper. These types of backing paper will dissolve when wet (onto the adhesive if still on the film—not good!) and they will powder when they are cut if a dull blade is used (leaving tiny specs of paper on the adhesive—not good!). Premium paper liners have a synthetic layer that makes them water-resistant. Two interesting things to note about the film liners: • They represent between 25 and 40 percent of the cost of the film, and • Paper liners are not recyclable because of the silicone they usually contain. Inks In general, there are four types of inks that are used for full-print film: solvent, eco solvent, latex and UV-curable. The topic of inks is big and deserves its own article, so I'll keep it general here. To avoid oversaturation of ink make sure that the printer has the right profile for the specific film being used. Solvent and UV-curable inks have to outgas for a specified amount of time after printing before lamination can be done. This varies based on the manufac- turer of the film. Latex ink dries quickly and so can be laminated as soon as the printing is done. UV inks are "greener" than solvents (fewer VOCs) and stick to more types of films, but they also tend to be less flexible and so will sometimes crack when, for example, they are applied into deep recessed areas. That said, the new generation of UV inks are much more flexible than before. With any type of ink, once it is added to the print film it reduces the film's durability. The main reasons for this are type/quality of the pigments used and that the ink layer is very thin. For example, with Avery 1005 EZRS before printing has a 10-year warranty and, and after printing the warranty can vary from three to five years, depending on the type of ink used. Single-color films—from cut vinyl to premium car wrapping films—have a much longer warranty in terms of color. The reason for this is there is simply more pigment or a thicker layer of ink used at the factory. In general, there are four types of inks that are used for full-print film: solvent, eco solvent, latex and UV-curable.